Music from the European folk, traditional and popular music traditions from musician/composer/arranger Paul James – saxophones, border bagpipes (Blowzabella, Evening Star), Belgian diatonic accordion virtuoso and composer/arranger Anne Niepold and we are delighted to welcome German harpist, composer and teacher Merit Zloch. Paul James is a saxophonist, bagpiper, singer and composer from Newbury who writes, arranges and performs music influenced by English and other European folk traditions. Paul was composer for the critically acclaimed production of John Milton’s ‘Comus – A Masque in Honour of Chastity’ at Shakespeare’s Globe Theatre and has composed music for TV, documentaries, theatre and contemporary dance, as well as the bands he plays in. He has been a member of the hugely influential folk band Blowzabella since 1980, and plays with his pan-European band Evening Star and the folk dance band The Playford Liberation Front. Merit Zloch is a harpist, composer and music teacher. 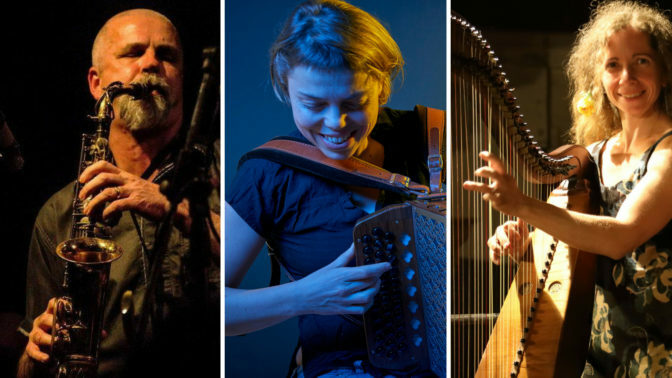 She sees herself in the tradition of the itinerant harp players of the 19th and early 20th century, travelling with her harp throughout Europe charming people with her original compositions and arrangements of historical dance music. She has played in bands almost as long as she has played the harp and is constantly fascinated by the interplay between musicians. She likes to arrange and develop pieces together with her band colleagues and to improvise. Merit researches historical dance manuscripts and organises musicians meetings, bals and instrumental workshop weekends.